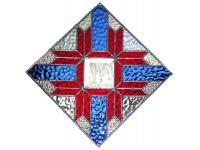 Clear square bevel surrounded by blue, red and iridescent clear glass suncatcher. 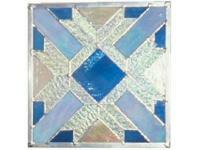 Blue square surrounded with blues and clear glass in this suncatcher. 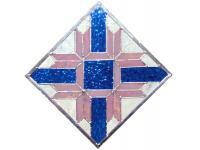 Blue square surrounded with blue, pink and clear glass on this square suncatcher. 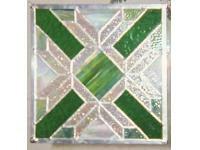 green and clear glass of mixed textures are featured in this square suncatcher.